In this section all storms are plotted which pass within 60 nautical miles (69 miles) of the island or through one of the 4 regions. One part contains storm tracks for all storms since 1851. For more detail plots have also been prepared for each decade. See: below. This shows the total number of hurricanes per week through hurricane season. It will show when the 'real' peak of hurricane season is, which can be quite different from the 'general' peak of all Atlantic storms. If you visit the Caribbean during hurricane season you can see you chances of being hit during your stay. This might actually be much lower then you think, eg. the last week of August (traditionally thought of as close to the peak of hurricane season) for the Eastern Caribbean is relatively quiet. See: below. Here the total number of hurricanes are plotted for each 5 year period since the mid-1800s. Are we seeing more and stronger storms lately? See: below. This is a summary overview of the number of hurricanes passing by for about all the Caribbean islands since 1851 and 1944. Which island is the 'Hurricane Capital of the Caribbean'? Has it changed in the last 60 years? When can we expect the first storm of the season? If the first storm doesn't form until August, does that mean that the remainder of the season will be quite slow too? There are several ways to navigate the 600+ pages in this section. 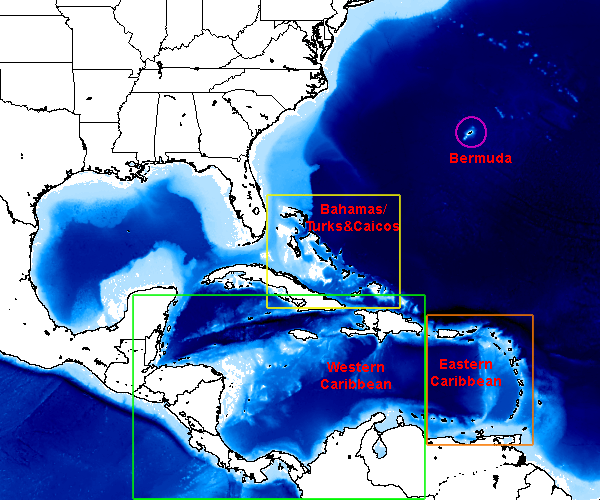 Below is a 'clickable' bathymetry map which takes you a more detailed map of the region of interest where you can easily locate your island of interest. The quickest way though is to use list of regions and islands below the maps. From there you can select the first three sections (see above): map (island location map, only for regions), all (tracks of all storms), dec (tracks of all storms plotted per decade), peak (peak of the season) and 5yr (5 year analyses). Tip: You can map all hurricane tracks with Google Earth using a KML file provided by guiWeather, or use a Google Maps interface at stormadvisory.org. 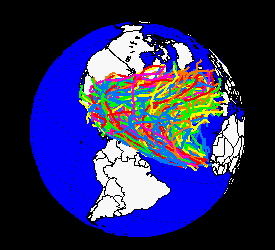 * Analyses are based on 'best track' data taken from the National Hurricane Center's North Atlantic hurricane database reanalysis project (HURDAT, dated March 14, 2011) created by the Hurricane Research Division, AOML, NOAA. Note that copyright applies to the entirety of this site.